Company’s name : NGO "Ukrainian Road Safety Association"
Informational campaign that includes a series of awareness-raising and advocacy activities aimed at drawing public attention to the need to ensure the safety of the most vulnerable categories of road users. Coverage of the Road Safety Week on TV and other media.. Demonstration of video in Hyundai train and presentation of the ILCAD on the railways, bus stations, higher education institutions. The Ukrainian Road Safety Association held an awareness campaign on level crossings safety to the International Level Crossing Awareness Day, which was held in the framework of the Second UN Global Road Safety Week. The awareness campaign was successfully held with the support of the Ministry of Infrastructure of Ukraine, the State Administration of Railroad Transportation in Ukraine (Ukrzaliznytsia), the State Inspectorate of Ukraine on Land Transport Security, the EU Project “Support to the Implementation of the Transport Strategy of Ukraine”. 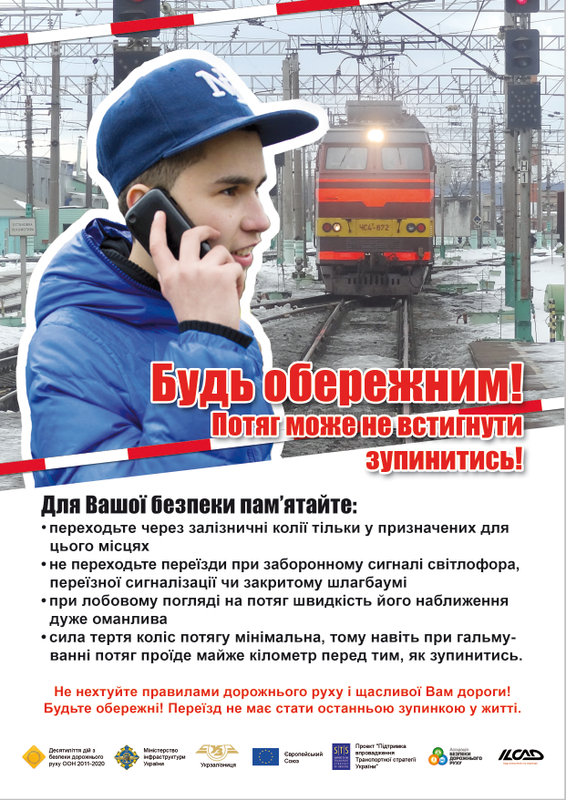 We have prepared the leaflets (please see attached), which were distributed through the channels of the Ukrzaliznytsia in Ukraine. a traveling exhibition will take place on the railway stations in the major cities of Ukraine (http://transport-ukraine.eu/en/news...). Moreover, the materials are related to the safety of people who use the transport and work in the transport sector. The leaflets developed by the URSA to the International Level Crossing Awareness Day were distributed at the exhibition in the city of Lviv. Ukrainian actions held in the framework of the international campaign “The Long Short Walk” in Ukraine. All the information you may see on our Facebook page - www.facebook.com/lsw.ukraine .